It is the Philippines…again in 2014! Based on the historical record the far northwestern Pacific ocean is by far the most active cyclogenesis basin on Earth. Including the Philippines Sea, the South China Sea, the Yellow Sea, and the balance of the northwestern Pacific region consistently generates the largest number of tropical cyclones on an annual basis. Smack in the middle of this region sits the archipelago of the Philippines, making it the most hurricane-vulnerable country in the world. Just last week the northern Philippines were hit by typhoon Kalmaegi, and no sooner had affected communities assessed their damage and initiated recovery efforts than a new storm, Fung-Wong began battering much of the same region. 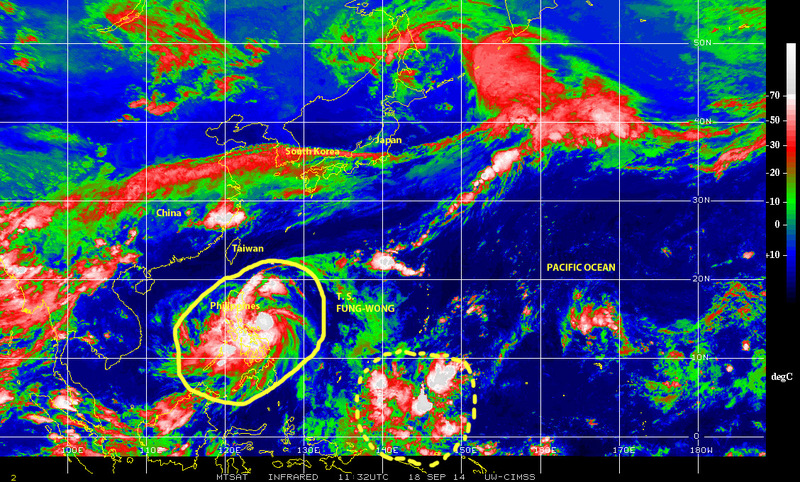 Even more worrisome is the large cell of disturbed weather that is currently following in Fung-Wong footsteps aiming in the same general direction of the Philippines. Many will remember super-typhoon Haiyan, named Yolanda by Philippine authorities, which hit dead-on in the middle of the Philippines Islands in November 2013 as the strongest tropical cyclone of record anywhere, causing upward of 6,200 death and more than US$ 3.0 billion in physical damage. In the past ten years alone, since 2004, the Philippines have sustained at least nine major typhoon hits, which have left more than 15,000 deaths in their wake, and billion of U.S. dollars in damage In addition this nations had seen many times that number in terms of impacts by weaker storms. On the average the Philippines are hit by tropical cyclones 6 – 9 times per year, with most of those hits taking place in the northern regions of the country. A characteristic of tropical cyclones generated in this region, and of those affecting the Philippines, is that they generally are rather “wet storms” meaning that they generated vast amounts of rain. As a result flooding, from flash floods in mountainous terrain, river overtopping their banks, and from storm surge, is a major damaging component and contributor to the death toll.